There are many cleaning companies that offer commercial services but how many of them truly know what they are doing? Steam Master Cleaning and Restoration doesn’t just treat your carpets we also take care of your vinyl flooring. You can buy floor cleaning products at the store, but who has the time to clean their entire commercial space? With Steam Master Cleaning and Restoration, we can effectively and efficiently clean your VTC flooring in San Antonio leaving you with something that truly shines. 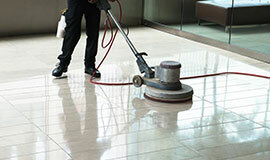 Reach out today to learn more about our floor cleaning services for commercial properties. Because we have many years of training and experience, we know what products really work and what ones may actually harm your vinyl floors. Using only high-quality materials you can trust that our techniques and processes are the best in the business. By taking our time, and paying attention to all of the details, we transform your floors from something average into something extraordinary. No matter the size of your business, we will take care of your floors. No job is too big or too small for us. Making your floor look like new is not only our goal, it is our mission. From start to finish, we believe in providing you with the service you deserve. You are our valued customer and we go out of our way to ensure that your commercial business’ VTC floor stands out. Make a statement with your VTC floors in a simple and effective way. For your Speedy Fast™ Bid, contact us today.